An image that captions itself. Nice. I’ve just got back from a very interesting presentation from Intel called ‘Screen Future: Shaping the future of TV’. It was a short session at the Millbank Tower with a small audience in which an impressive panel of people talked about what kind of entertainment we could expect on our Atom-powered smart TV’s of the future. 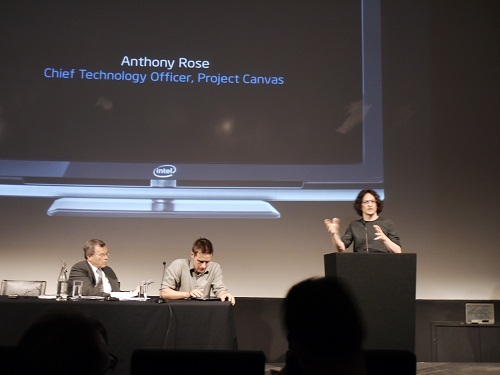 The most interesting panelist by a long way was Anthony Rose, former CTO of Kazaa, head of the BBC iPlayer project and now leading the charge for Project Canvas, the on demand delivery system being developed by the BBC, ITV, Channel 4, TalkTalk and BT. Rose went into a good level of technical detail about how Canvas will work. One major influencing factor, he said, was that people used iPlayer in traditional, linear way much more than he expected In other words, demand for TV streams outweighed on demand plays of shows from earlier in the week. The response in Canvas is to make use of multicast, a technology by which bandwidth for live feeds over IP can be dramatically reduced. At the moment, if 800,000 people watched England versus Slovenia in the World Cup over the net, the BBC’s servers and the internet backbone has to cope with 800,000 individual service requests and feeds. With multicast, only one stream is fed out into the internet and duplicated at each node, where it branches out to fill demand still using just one part of the total available bandwidth at any point. In layman’s terms, it means that instead of 100 pieces of identical data arriving at your exchange because 100 people in your area are watching the footie, only one feed arrives at the exchange and is duplicated out only down those connections that want it. It sounds simple, but in internet terms it’s a bit like being able to have a two way conversation through your TV aerial. At the moment, it’s a criminally underused technology, so kudos to Canvas for planning it in. The other interesting design point about Canvas that Rose talked about is that it will be designed as an instanced layer of software which can sit on any hardware which supports the API. That means set top boxes should always be able to run the latest version, years down the line. It’s also an open platform, and King is expecting indie developers to run with some ideas for building in layered information over the top of the Canvas system. Not everything was shining good newsthough. Sir Michael Sorrell, CEO of WPP, the massive global advertising conglomerate, also spoke at the event and revealed the figures his organisation is using for planning the future. Platform owners, rather than content providers, will be the big winners, he said, and subscriptions will make up 60% of overall TV revenues by 2020. So good news for Sky and News Corp, not so great for independent film makers or hard news organisations with a public service remit. Sorrell also said that he expected more of his clients to get involved with content creation, citing Unilever’s involvement with the production of Ugly Betty in China. I think this was supposed to be positive news, suggesting that there are alternative revenue streams for us beleaguered “content providers” to explore, but it still leaves a bitter taste in the mouth. On the brightside, though, Canvas is an exciting project which is being designed with the blurred distinction between TV, IPTV and social media in mind. Maybe we’ll be able to tune into the Demotix channel at some point in the future? That could work. Hi, i must say fantastic site you have, i stumbled across it in Bing. I bought myself the lumix tz7 digital camera. Its just a pleasure to use.